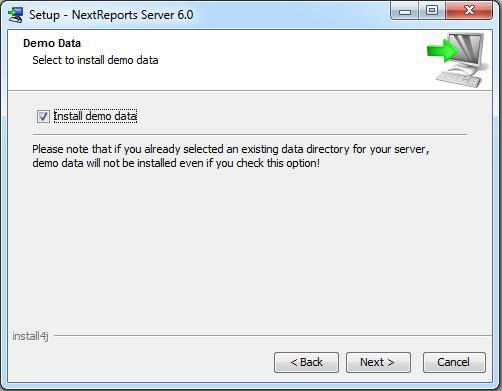 NextReports Server has a demo online at http://demo.next-reports.com where you can login with demo / demo. When you install the server by yourself, till version 6.0, you won't see anything. It is a fresh content repository. To make it more interactive and to see main functionality inside dashboards, version 6.0 will allow to specify at installation if you want or not to have some demo data. If you select this option, you will have a Derby demo database (same used inside NextReports Designer), some charts, some reports and a number of dashboards in which you can see the main chart types, alarms, tables, a pivot, a drill-down chart and a drill-down table.